A dash camera is a recording device which captures the activities at the front and the rear of the vehicle. This device records in full HD and is well suited for commercial and personal vehicles. The camera provides the date and time on screen for video evidence in case of an accident. At Shammy’s we only carry state-of-the-art cameras. Record activity at the front and rear of your vehicle in High-Definition with the Momento M4 Dual Dash Cam system, which provides up to 270º of surveillance coverage for your vehicle. HD (720p) Dual dash camera system including front camera w/ LCD, rear camera, GPS antenna, and 16GB micro-SD memory card. 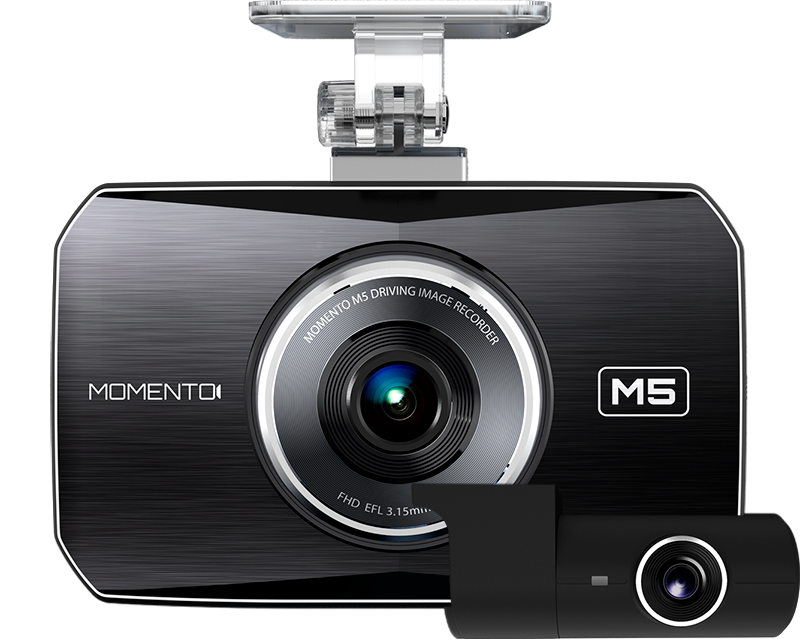 The Momento M5 places two HD, wide-angle cameras at the front and rear of your vehicle, providing 270º of surveillance coverage. Full HD (1080p) Dual dash camera system including front camera w/ LCD, rear camera, GPS antenna, and 32GB micro-SD memory card.